Tahiti, the largest island of the 118 islands and atolls that make up French Polynesia, towers over the ocean like a proud and royal Queen and is appropriately crowned by a circle of majestic peaks. Tahiti is a word that evokes images of lush tropical landscapes; of crystal clear azure lagoons surrounded by soaring volcanic peaks; of love and romance; of gentle goddesses and fierce warriors, an island of dreams and legends. The first explorers returned home boasting that they had discovered heaven on earth; writers and artists have captured its beauty and have only been planning when to go back. As a multicultural melting pot, the people of Tahiti and Her Islands (approx. 245,405 inhabitants) include Polynesians, Europeans, and Chinese. 70% of the population lives in Tahiti and of those 75% reside in Papeete or its suburbs. Papeete is the capital city and the commercial hub and is a busy city weekdays. It has a colourful market, boutiques, bars & restaurants and an attractive waterfront area, home to cruise ships, yachts, a boardwalk and attractive public gardens and spaces. Tahitians are proud of their islands and their relaxed disposition is often expressed in their passion for dance and music. The same can be said for their love of the sea, whether in fishing, surfing or traditional canoe racing. Despite being a modern society, Tahiti has not lost its traditional flair for extending a genuinely warm welcome to visitors. The island of Tahiti is often used as a transit island, but in fact is one of the most diverse islands within French Polynesia. It provides both city life and conveniences along with island beauty that holds many hidden treasures. 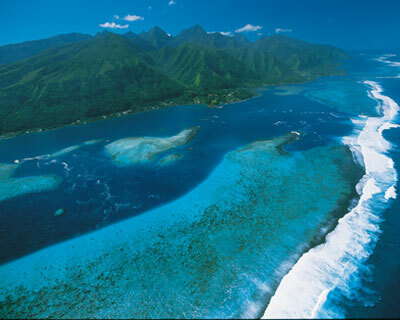 Tahiti is also an ideal base to discover her sister island Moorea, just a short 35 minute ferry ride away.